We offer fully furnished, single and double rooms for rental for our members to house themselves in for the duration of their studies. We are constantly improving the structure of the house and the amenities it offers to keep up with current tastes and attitudes. What furniture is included in the room rental? Rooms come furnished with a bed, desk, dresser, and closet. Is the internet and television included in the rent? No, the housing association does not charge for television (satellite) or fiberoptic internet provided throughout the house, but does not guarantee its reliability or availability. Room assignments are determined most typically by the active chapter, but the housing association reserves the right to change room assignments. What happens if I want to rent a double but can not find a roommate? This happens rarely, but unfortunately, you will have to pay the rent for a single. Costs for room rental (not security or membership dues) are payable in two installments, due at the beginning of each semester. The costs below do not include the semesterly membership dues or initiation fees. These fees are collected by the local chapter (made up and governed by the active men of the chapter) and the national organization. 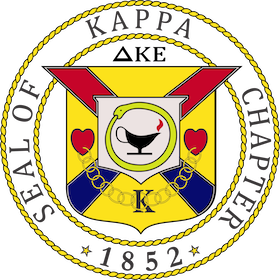 The Kappa Chapter Housing Association does not control the fees set by either the local chapter or the national organization. Please note that J-term costs are $750 for all tenants other than Seniors, who will enjoy free rent for this period.